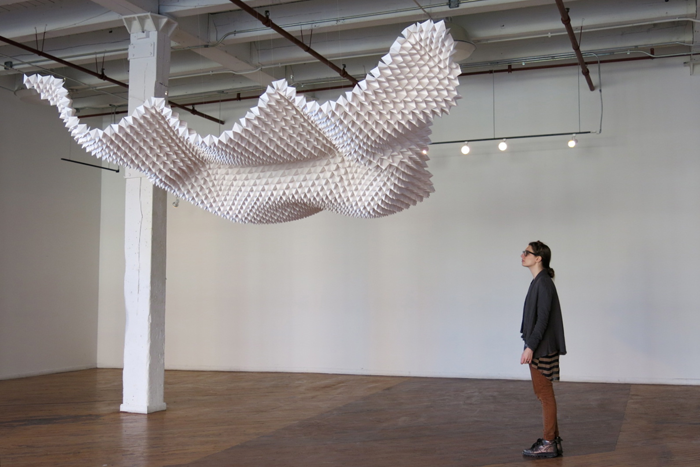 A massive paper airplane poised for flight, a pixelated cloud, a space-age hammock—depending on where you’re standing, artist Christian Saucedo’s paper sculpture “PLEATS,” which was exhibited last Saturday at the Chicago Urban Art Society in Pilsen, could be any of these. Stationed in the first floor of a hulking brick building that also houses a medical supply store and a boxing studio, the Urban Art Society boasts a cavernous, loft-style gallery space. Apart from “PLEATS,” suspended from the ceiling of the room, the space was populated only by a sparse array of furniture. The installation was a bright white that seemed to glow beneath the warm gallery lights. Measuring about nine-by-eleven feet and composed of 4,940 handmade geometric paper forms painstakingly fixed together, it presented an imposing presence in spite of its insubstantial weight. The folded pieces of paper created a series of triangular pockets that together formed the curved, sloping form of “PLEATS,” which was alternately draped languidly and stretched taut. This fluctuation in tension evoked movement and fluidity in the piece, though it was composed of a series of rigid shapes. On his website, Saucedo cites a quote from Honoré de Balzac as the inspiration for his work. It reads: “The mission of art is not to copy nature, but to express it.” “PLEATS,” which is Saucedo’s artistic interpretation of the structure of a whale’s belly, embodies this sentiment. The work distills the essence of this natural structure, capturing its complexity and mimicking its shape without providing a literal depiction of its form. Saucedo’s style is a sort of contemporary sculptural impressionism. He emphasizes the whale belly’s movement through his undulating paper framework and its biological complexity in the intricate triangular folds. The piece expresses the fundamental aspects of the whale belly with no more than a nod to its real-world anatomy. Though monochromatic and relatively unadorned, “PLEATS” conveys the depth and complexity of a natural form in its striking simplicity. It is a study in contradictions, at once flimsy and formidable, rigid and yielding, minimal and manifold.